This is more than likely just a rumour but since it is Nicole Richie related i will post it under gossip! Paris Hilton's former BFF Nicole Richie is so upset by the socialite's split from Benji Madden, she's preventing him from meeting any potential new girlfriends. The hotel heiress confirmed her break-up from Good Charlotte rocker Madden on November 21, when she admitted the couple was "taking a break" after nine months together. According to Joel Madden -- Benji has been coping well with the split. But the same can't be said for Richie, who is reportedly doing her best to keep her future brother-in-law single until he can be reunited with Paris Hilton. 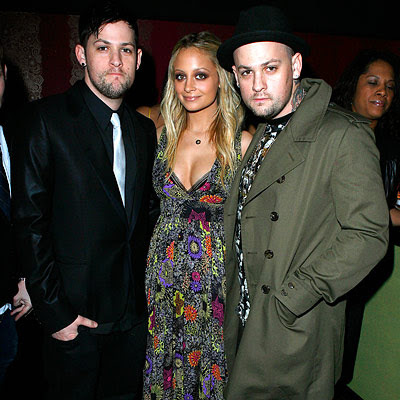 A source, who attended a recent launch party for Good Charlotte's new "Greatest Remixes" album, tells the New York Post's Page Six, "(Richie) has been really possessive and stops him from talking to other girls. Benji was approached by dozens of ladies. Girls were trying to flirt with him ... but Nicole kept getting in the way. "(Richie) stopped every girl trying to take a photo of him (and) dragged him by the arm (away from the girls)." I'm sure a couple of months ago according to the tabloids Nicole Richie was furious that Paris Hilton was dating Benji Madden but now they want us to believe Nicole will stop at nothing to get them back together .. gossip websites .. make up your minds!! Totally agree, the tabloids are so full of sh*t. I hate when they call Paris and Nicole 'Former friends/Frenemies'. They had a feud for a while but it's ended since ever. I thought mag rags would be up to date on their research right?